super pretty dress! i love drop waists! simply fabulous! the necklace & bag are perfect additions to the look! YAY! this dress looks AMAZING on you!!! i came SO close to picking this one too!!! loving your layered necklaces also! Fabulous dress and necklace from Zara. Love this outfit! Love how you layered your necklace! I have yet to try the drop waist dress – I am afraid it will make me look short legged and hippy. Great dress!! I've been slow to try a drop-waisted dress, but I may have to give it a try now! Jealous… I am sooo jealous! That is the most amazing dress… and those heels are too die for! Love the Houndtooth dress. I looks amazing on you. Also the pop of color shoes! Houndstooth is one of my favorites, and this dress is simply wonderful! I think the way you combined the necklaces was so creative, and the clutch is so awesome! not only do you look insanely stunning, this dress is amazing and girl, these photos are editorial quality. GORGEOUS! always love a good houndstooth! Beautiful dress and love that clutch! stunning! I love the drop waist in the houndstooth print! Your necklace is gorgeous too! super cute dress!! love it!!! OMGosh. stop that dress is amazing! plus pairing it with that great art deco necklace & black leather clutch . . . . so fantastic. I love this dress! It looks great on you. And I love your choice of shoes and accessories! Ahhh yellow shoes! You are so fabulous I can't stand it! Except, I can. I have the same length hair and would love to know how you styled it today. It's so cute! I love the vintage look of a drop waist dress! Because I'm on the shorter side, I have to be mindful of where the "drop" falls. Love your version! When Alyson did a London Times giveaway, this was my favorite! It looks so great on you, and I love the details. Love that this look is coming back. As a short-waisted girl, this is so flattering on me! I love that necklace too!! Needsless to say that I LOOOOOOOOOVE things houndstooth, and by extension, I sooo LOOOOOOOOOOOOVE this dress. Gorgeous flattering dress! Love the coordinating nails! Beautiful dress. Love this trend but I wonder if it flatters a curvy body because some clothes don´t really look good on everyone, I really like the style but I don't think it would work on me. You look STUNNING in this drop waist dress! Love the black and white print with a pop of color from the shoes. So so pretty! You look fabulous in that dress! I love how you paired with yellow pumps too. You look absolutely amazing in that fabulous dress ! Love the dropped waist ! Simple and gorgeous – love it! I love the print of this dress…so cute on you! Love how that houndstooth print lessened the super feminine touch of this drop waist dress!! A very flattering silhouette on you indeed! I love how you paired the classic houndstooth with punch yellow heels! 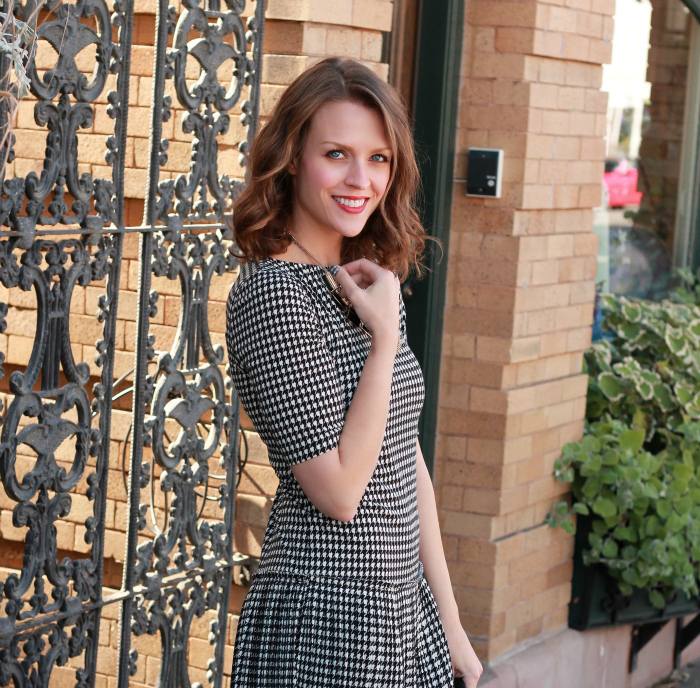 I adore houndstooth – and this dress looks contemporary, but with a lovely vintage flare. So cute on you! this is gorgeous, esp. with those muted yellow shoes! 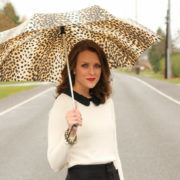 That statement necklace is a knock out! Loving it! I love love your style! You are such an inspiration for my new little blog. Keep the good stuff coming pretty girl!